Must be a long time since you taste a smoothie last time, right? Alice York shares a simple vegan recipe of her tasty dessert. 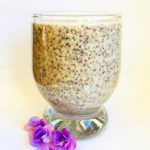 All you need is poppy and flax seeds and banana, 2 minutes and that’s it! That smoothie will feed you with calcium (poppy is the leader of calcium containing), relax you and reduce the pain (that's a poppy, mind you ). It will lift you a perfect mood as well . Soak the flax seeds in the night. Mix all together - seeds, banana, water and spices. You may add any sweetener for that dessert. This recipe takes part in vegansurvive recipe competition. You can suggest your own original recipe via google forms. Tried this recipe?Mention @vegansurvive or tag #vegansurvive! Do you like us? Support us - buy our pretty clothes in our website.